Asha Kumari is senior congress leader of Himachal Pradesh, and All India congress committee member. She was elected as member of Parliament for fifth time, this time from Dalhousie seat of Himachal Pradesh vidhan Sabha. Asha kumari was AICC congress party in-charge in last elections in Punjab where Congress party won in leadership of Amnrinder Singh. Asha Kumari is former state education minister (independent) and worked at different in party as well as government. She had faced up and down in her life, and this makes her tough and strong leader. Asha Kumari born on September 23rd,1955 at New Delhi. Her father was retired chief secretary of Madhya Pradesh. She studied at Bhopal and then married in a Royal family in Himachal Pradesh with Sh. Brijendra Singh on 19th April, 1979. Asha Kumari was general secretary of NSUI of MLB Girls College, Bhopal and was one of founder member of NSUI. She was elected for Himachal Pradesh Assembly in year 1985 and after that current term is her 5th term as member of legislative assembly. She worked at different positions of Congress party as well as government. She was in-charge of Punjab congress in last Assembly Elections of Punjab where Congress won. Asha Kumari Born in year 1955, and her father was chief secretary of Madhya Pradesh government. She married in a royal family of Himachal Pradesh in year 1979. They have one daughter who is Horticulturist, Social and Political Worker. Asha Kumari started her education in Bhopal and did her Bachelor degree from MLB college Bhopal where she was elected as general secretary and than in Bhopal University she was elected as president of Bhopal University student union. Asha Kumari started her political career at student level, and she was one of the member of NSUI. She was later elected as general secretary of college and than president of Bhopal University student union. After her marriage in Himachal Pradesh she was elected for state Vidhan Sabha in year 1985 from Banikhet (which is known as Dalhousie now) and after that she was elected for 4 more times from state assembly. Asha Kumari remained at different positions , she served as Education minister (independent). Asha Kumari is active on social media as well and she used to update all her work and achievements through Facebook, Twitter , YouTube and Instagram etc. Asha Kumari is one the politician in Himachal Pradesh who is Everytime updated on social media and update people with all new scheme and launch/inauguration in her area or state by state government. Some of her social media profiles are here below. Asha Kumari is daughter of Retired chief secretary of Madhya Pradesh. Asha Kumari was founder member of student wing or congress party NSUI. She was jailed during an agitation in favor of late Prime Minister Mrs. Indira Gandhi, September 1978. She became general secretary at college level and president of Bhopal University student union. Asha Kumari won in 1985 from Banikhet. Asha won in year 1993, 1998, 2003 and 2012. She serves state as Education minister (independent) and Regional Director, INTACH, 1990-91 and State Convenor, INTACH. She worked as general secretary of HPCC and now member of AICC. 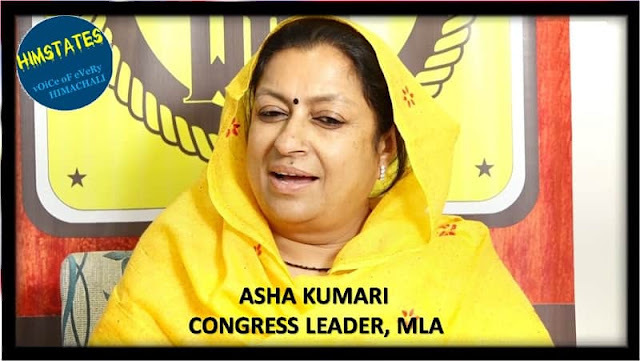 Asha Kumari was front face in Punjab Elections with Amrinder singh and worked as party in-charge.